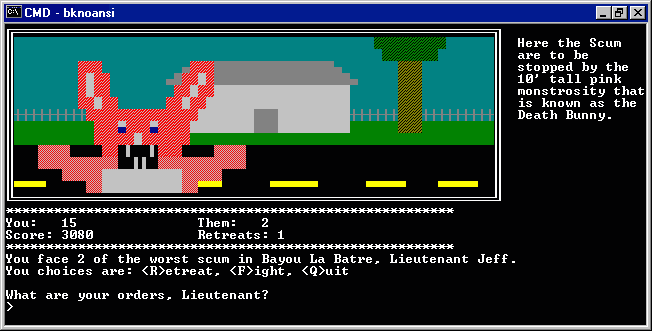 I have made a version of the Benny and Kenny Defense Plan game that doesn't require ANSI.SYS. 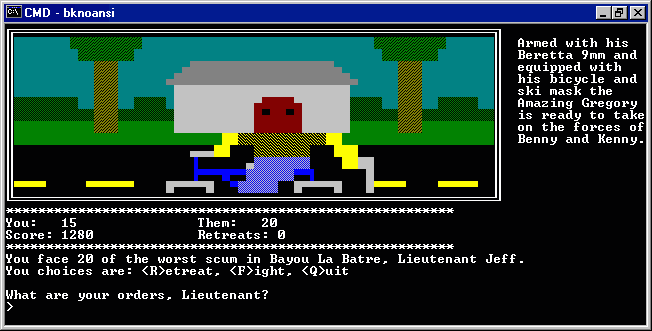 In a return to my old habit over the years of periodically re-writing this old inside joke of a game I had been thinking about a Java version. Not ready to actually invest the time in that just yet, but to tide you over here's a modification to the C version so that will at least run out of the box on Win2K/XP without having to dork around with installing ANSI.SYS. This will allow even the truly lazy to experience this gerrky little game. Note that for the full effect you should run the DOS prompt full-screen (hit ALT+ENTER), but its easier to take screenshots of a window. Benny and Kenny Defense (BK) is a strategy game pitting you against the evil twins, Benny and Kenny, and their armies of Scum. The first thing you must do is choose one of 10 locations at which to engage the enemy. You always start a battle with the maximum number of forces. The Scum only refresh their numbers at the beginning of each level. In each round of battle, you will have the choice to retreat, fight, or quit. If you choose to fight, you will be asked how many of your force will actually take part in the combat for this round. This is important, because the more you attack with, the more damage you can do. Also, the more you attack with, the more you are risking. If you use all your forces, you could be completely wiped out ! If you kill all the Scum, then you go on to the next level. If you choose to retreat, then you can fight the Scum at some other location. You will have your lost forces replaced, but the Scum will still only have what they had when you retreated. The drawback is that you can only retreat from 5 locations per level. With each level, you get 5 more forces, but the Scum get 10 more, so at higher levels you must learn to be more careful !